Paula Hill, 41, of Livingston had a warrant out for her arrest from Walker County. 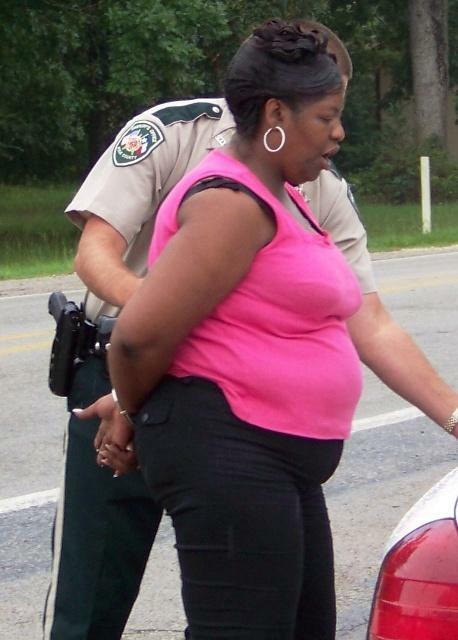 Reckless Driving Alerts Cops to DWI and Possession, LIVINGSTON, August 12, 2008 - Shortly after 12:30 pm on August 12, 2008, multiple reports were phoned in to the Polk County Sheriff's Office of a driver in a white SUV that was running cars off the road. The Reckless driving was reportedly happening on Highway 146 South (just south of Livingston). Sheriff Deputy Chris Lima was dispatched to the scene. The driver reportedly pulled into 146 Grocery (formerly R&D Grocery). By time Lima got to the scene, the driver of the vehicle, Paula Hill, 41, of Livingston, had gotten back into her 1999 Chevy SUV and was about to leave when Lima stopped her. Hill got out of the car and by all appearances, was intoxicated. Lima searched Hill's purse and found multiple quantities of prescription medication (including pain killers and muscle relaxers). Some of the medication was in bottles and unlabeled, other pills were found randomly in the vehicle. Hill's vehicle had the window sticker "Father, Son, & Holy Ghost" on the back windshield. Hill was placed under arrest for driving while intoxicated, possession of dangerous drugs, and it was learned through dispatch that Hill had an outstanding warrant for her arrest out of Walker County for probation violations. Hill's vehicle was towed away from the scene by J&C Wrecker Service and will be stored at J&C Auto Body about 2 miles north of Livingston on Highway 59.